WOW!! LionHearted Boxing Academy (Owner/Coach) Eddie Ray Brown Head Coach Kenneth Shepherd, and coaches. Would like to send a special thanks and appreciation to the Head Texas Official: Derwin Richards, Chelbi Curvey, Jemiah Richards, Keith Delahoussaye, Monica Camacho, Clara Savannah, Guest Official Steve Sodeman (Iowa)Head Louisiana Official: Arthur Scott, Harold Duhon, Damon Marceaux, Kyle James, Sonia Charles. For their effort which led to the succuss and a great show in Port Arthur, Texas. 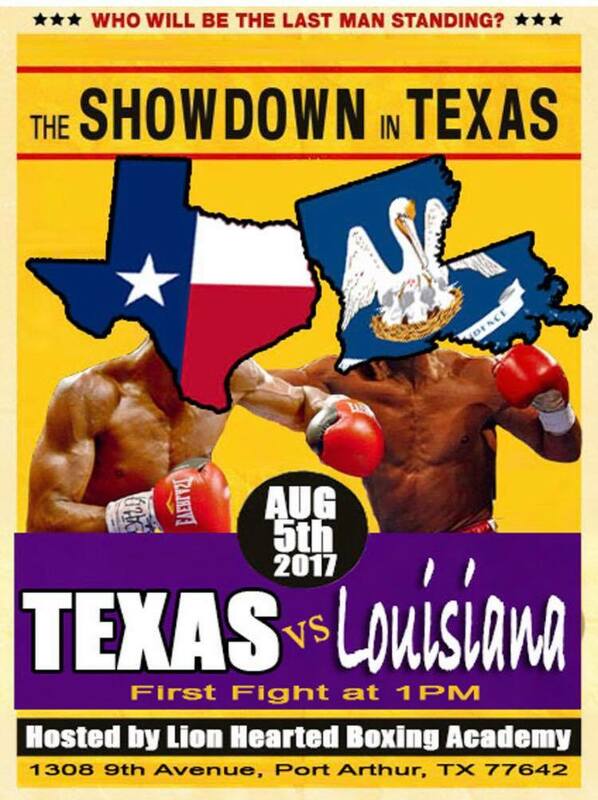 The Big Showdown “Texas Vs Louisiana” was a better turn out than we expect. Thanks for helping us work through the few hiccups we had. I would also like the thank all the coaches and fighters who participated. It was very competitive fights and Louisiana won the title with a 9-8 score. We would like for this to continue to grow, and have more participants next time. Call me when your free Coach?